In addition to the gorgeous limited edition Thakoon for NARS collection, NARS is releasing one more brand new nail polish color as part of their full Summer 2012 line. It's called Trouville and it's quite different from Thakoon's saturated brights. NARS Trouville. Trouville is a soft pink creme. It's slightly warm-toned and not completely opaque, almost jelly-like in finish, but not quite that sheer. It's soft, but it's not pastel. It has a vintage, 1940s-1950s look to it. The formula on this was nice, but not as perfect as the Thakoon collection's formula. This one is thicker, doesn't flow as smoothly and isn't as opaque, but it didn't give me any trouble. I did three coats. Drying time is average. Usually I have a hard time wearing these types of warm pinks, but this one doesn't give my hands that strange, dirty look like others do. It's actually kind of flattering and the color isn't too washed out or bland. It stands out, but not with the intensity of an opaque, white-based "mod" pink. Still, not really my type of color, but definitely not a bad polish overall. 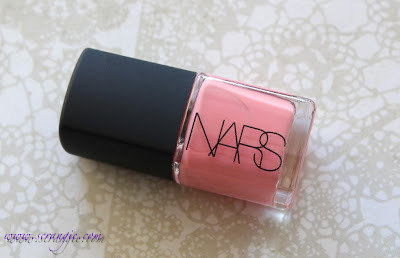 The NARS Summer 2012 collection, including Trouville nail polish, is available now. I don't have many pink polishes, but this is a pretty one. It's really not too bad, and I am not a pink polish fan most of the time! So Pretty! I'm a sucker for pinks! I want to marry your nails. In any color. Ooooh, I love this shade. It looks great! Ugh love it, anyone know of any dupes? I kept reading it as "Troutville" and then was bummed out when it wasn't more of a "fishy" pink color, lol. That said, it's probably a lot nicer looking this way. I kind of dig it. Mmm, I think I shall be skipping on this one. After the beautiful Thakoon colours, I know I shall be spending my blog budget on them instead! Ummm - not sure. This is really kind of pale looking and not all that unique.